Find a Queen Tribute Band for hire near you in minutes! Option 1. Enter your event location below & contact a Queen Tribute Band directly! Option 2. Request multiple quotes from available Queen Tribute Bands Get Quotes! Option 3. Read information & advice on hiring Queen Tribute Bands Read Advice! WANT TO KNOW MORE ABOUT QUEEN TRIBUTE BANDS? Read on for the most comprehensive guide to booking a Queen Tribute Band, including how much a Queen Tribute Band costs, exactly what they will do at your event, plus tips, advice and information to help make your event one to remember! 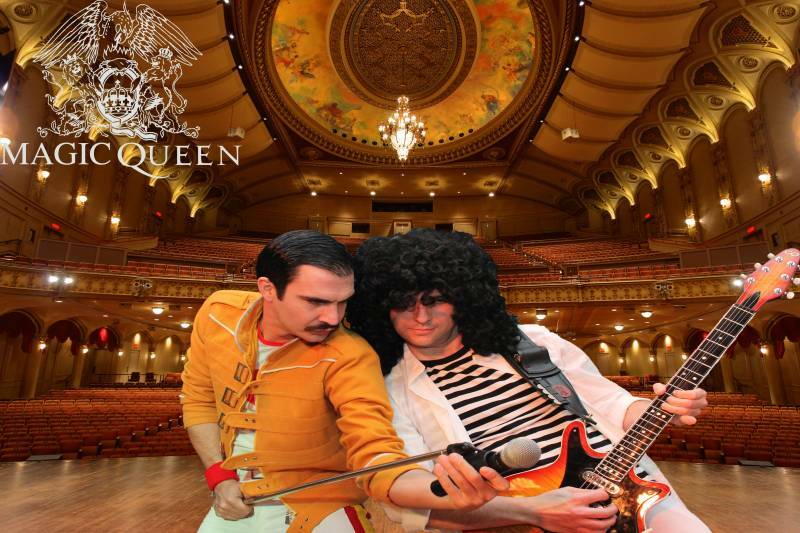 With a Queen Tribute Band you will get a group of professional musicians who will rock you with a full on Queen show! What exactly will a Queen Tribute Band do at your event? Hire a Queen Tribute Band and you will get 4 musicians who will impersonate the flamboyance of Freddie Mercury, the intricate guitar work of Brian May, the thundering drums of Roger Taylor, and the thumping bass lines of John Deacon! Queen are considered one of the greatest British bands of all time. Their appeal is widespread because of the vast amount of genres covered during their amazing career. You may think of Queen’s Glam hits, Queen’s Disco hits, Queen’s Pop hits, and Queen’s Rock hits! Mainly, a Queen Tribute Band will entertain your audience with a fantastic live show that will put the wow factor into celebrations and impress your guests, whatever their entertainment tastes may be. What event types are Queen Tribute Bands hired for? A Queen Tribute Band can come in many forms and a few may even offer a stripped down version of Queen songs to play on acoustic guitar such as ‘Crazy Little Thing Called Love’. A Queen Tribute Band would be perfect for an occasion such as the wedding drinks reception as the newlyweds are welcoming everyone into the wedding drinks reception! As the wedding breakfast entertainment, a Queen Tribute Band can be set up on stage to play some of the greatest Queen hits live as the wedding guests are pouring in! The bride and groom can be cutting the wedding cake to ‘Radio Ga Ga!’. Hire a Queen Tribute Band for your evening reception entertainment and it will be like having your very own private recital of the hit Queen musical ‘We Will Rock You!’. The Queen Tribute Band will fit some the best of Queen's music into a packed show that will have all of your wedding guests rocking out! By the end of the night, we would hope for the bride and groom will be singing ‘We Are the Champions!’. Book a Queen tribute band for your work-do evening entertainment! Whether it’s a work leaving do, or a end of financial year party, your co-workers will all appreciate some Queen being played by a professional group of musicians! 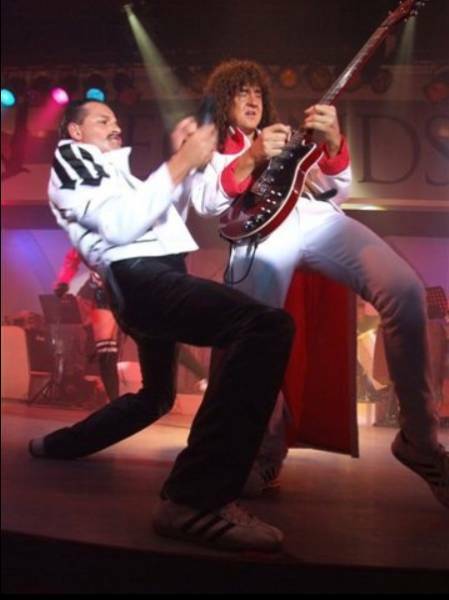 The Queen Tribute Band will consider everything from the Queen back catalogue of amazing hits that may include: ‘Fat Bottomed Girls’, ‘Hammer to Fall’, ‘Another One Bites The Dust’ and if you’re lucky enough, they will cover the great Queen duet with David Bowie: ‘Under Pressure’. A Queen Tribute Band can play for various other corporate events including trade shows and product launches! Because of the strength of the Queen brand, the Queen Tribute Act will grab the attention of potential clients and have them clapping along to ‘We Will Rock You’ in no time! One of the great appeals of Queen was the outstanding showmanship of Freddie Mercury. 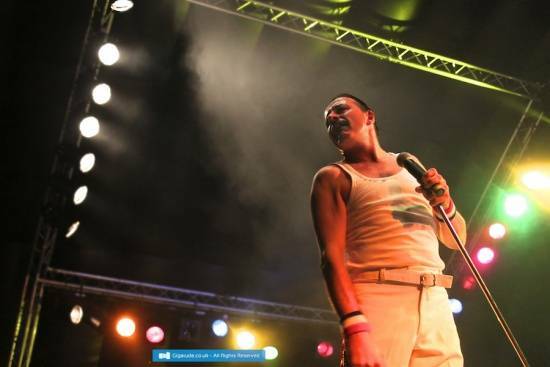 Freddie was big on crowd participation and the Freddie Mercury Impersonator in a Queen Tribute Band will get your crowd involved too! So, when you hire a Queen Tribute Band for your birthday party, you can expect a few sing-alongs to get the audience in the party mood! Maybe you are hosting an annual tribute party to the late, great Freddie Mercury? What better way to honour one of the greatest frontmen of all time than by hiring a Queen Tribute Band! All the Queen fans at your Queen party will fall in love with the band all over again and all the newcomers to this brilliant music will be converted! Expect your crowd to dress up in Queen fancy dress including sequins, glitter, platform shoes and the great Freddie moustache! How much do Queen Tribute Bands cost to hire? Our simple to use entertainment directory allows you to firstly search for the best Queen Tribute Bands who are local (or travel to your area) and then via the contact form you may message them directly to enquire for a no obligation quote to perform at your event. Some acts will also add a rough price guide to their profile for your convenience. What are the usual set formats and performance lengths for Queen Tribute Bands? A Queen Tribute Act can tailor their performance times to suit you and your event, however, on average a professional Queen Tribute Acts will perform for two 45 minutes sets. How much space will a Queen Tribute Band need at your event? This depends how many musicians they will use in the Queen Tribute Band. As well as a Freddie, Brian, Roger and John, the Queen Tribute Band may have additional members such as a keyboard player. As a rough guide, a 5 piece Rock Band will need a stage areas that is 5 metres wide by 3 metres deep. What equipment and set up requirements do Queen Tribute Bands need? As with most artists who sign up to Entertainersworldwide.com, a Queen Tribute Act will provide all of their own equipment. You may want to enquire if an artist needs a PA to amplify their sound, in which case we would advise to use our easy to use messaging service to find out. We do ask that each performer gets a backstage area in which they can prepare for the performance ahead. If your venue does not have a backstage area, then we kindly ask that you enquire with the venue to seek an alternative space in which the performer can comfortably get ready to entertain. How can you find and book a Queen Tribute Band with Entertainersworldwide.com? WANT TO RECEIVE A RANGE OF QUOTES FROM Queen Tribute Bands?